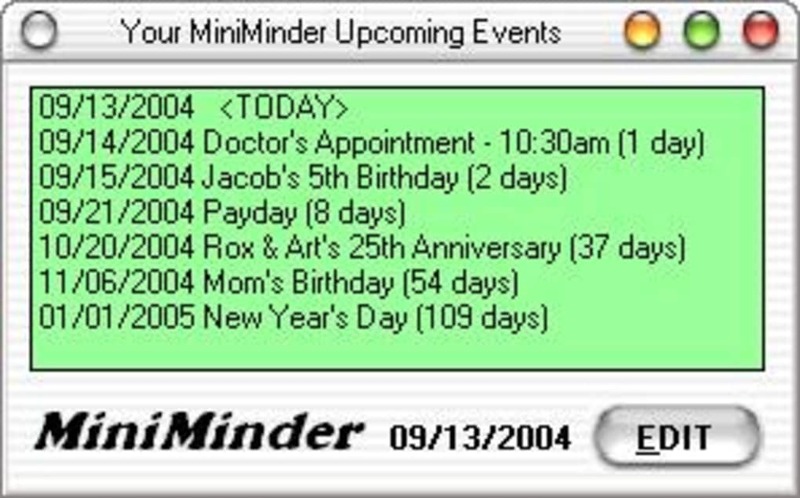 MiniMinder is a regular, free Windows software, that is part of the category Productivity software with subcategory Planners (more specifically Tasks & Appointments). Since we added this program to our catalog in 2005, it has obtained 6,053 downloads, and last week it gained 5 downloads.The program version is 7.31 and it has been updated on 12/28/2007. It's available for users with the operating system Windows 98 and previous versions, and you can get it in English. MiniMinder is a program that needs less free space than many programs in the section Productivity software. It's very heavily used in countries such as Croatia, United Kingdom, and United States. MiniMinder is a slick date reminder program which gives an attractive daily countdown to any upcoming events which you've chosen to track. The program is designed to be small and unobtrusive, but how you size it and where you put it is entirely up to you. If you're the type of computer user who starts up their computer every day, MiniMinder is there for you with your reminders each time you reach the desktop. If you're the type of user whose computer is always on, MiniMinder can be minimized (the orange button) to the System Tray, where it uses the absolute minimum of system resources. When the new day arrives, so will your helpful reminder, displaying itself until you send it back to the tray. What do you think about MiniMinder? Do you recommend it? Why?